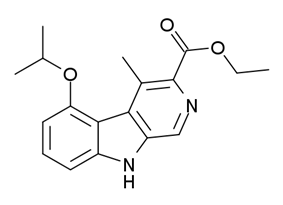 ZK-93426 (ethyl-5-isopropoxy-4-methyl-beta-carboline-3-carboxylate) is a drug from the beta-carboline family. It acts as a weak partial inverse agonist of benzodiazepine receptors, meaning that it causes the opposite effects to the benzodiazepine class of drugs and has anxiogenic properties, although unlike most benzodiazepine antagonists it is not a convulsant and actually has weak anticonvulsant effects. In human tests it produced alertness, restlessness and feelings of apprehension, and reversed the effect of the benzodiazepine lormetazepam. It was also shown to produce nootropic effects and increased release of acetylcholine. ^ Camerman, A; Mastropaolo, D; Hempel, A; Camerman, N (2005). "Ethyl 5-isopropoxy-4-methyl-beta-carboline-3-carboxylate: structural determinants of benzodiazepine-receptor antagonism". Acta Crystallographica C 61 (Pt 4): o265–6. ^ File, SE; Pellow, S; Jensen, LH (1986). "Actions of the beta-carboline ZK 93426 in an animal test of anxiety and the holeboard: interactions with Ro 15-1788". Journal of neural transmission 65 (2): 103–14. ^ Jensen, LH; Petersen, EN; Braestrup, C; Honoré, T; Kehr, W; Stephens, DN; Schneider, H; Seidelmann, D; Schmiechen, R (1984). "Evaluation of the beta-carboline ZK 93 426 as a benzodiazepine receptor antagonist". Psychopharmacology 83 (3): 249–56. ^ Dorow, R; Duka, T; Höller, L; Sauerbrey, N (1987). "Clinical perspectives of beta-carbolines from first studies in humans". Brain Research Bulletin 19 (3): 319–26. ^ Duka, T; Goerke, D; Dorow, R; Höller, L; Fichte, K (1988). "Human studies on the benzodiazepine receptor antagonist beta-carboline ZK 93 426: antagonism of lormetazepam's psychotropic effects". Psychopharmacology 95 (4): 463–71. ^ Duka, T; Edelmann, V; Schütt, B; Dorow, R (1988). "Beta-carbolines as tools in memory research: human data with the beta-carboline ZK 93426". Psychopharmacology series 6: 246–60. ^ Duka, T; Ott, H; Rohloff, A; Voet, B (1996). "The effects of a benzodiazepine receptor antagonist beta-carboline ZK-93426 on scopolamine-induced impairment on attention, memory and psychomotor skills". Psychopharmacology 123 (4): 361–73. ^ Moore, H; Sarter, M; Bruno, JP (1992). "Age-dependent modulation of in vivo cortical acetylcholine release by benzodiazepine receptor ligands". Brain Research 596 (1–2): 17–29. ^ Moore, H; Sarter, M; Bruno, JP (1993). "Bidirectional modulation of stimulated cortical acetylcholine release by benzodiazepine receptor ligands". Brain Research 627 (2): 267–74. Note: See for a full list of GABAA PAMs.